Milena M. Parent, PhD., is an Associate Professor at the University of Ottawa and Norwegian School of Sport Sciences. She is a research fellow of the North American Society for Sport Management and an Early Researcher Award holder of the Government of Ontario. Her research areas include organization theory and strategic management as they relate to preparing and hosting major sports events. She is notably interested in stakeholder management, networks and governance aspects. Milena Parent is an Associate Professor in sport management in the School of Human Kinetics at the University of Ottawa, as well as at the Norwegian School of Sport Sciences. She holds a Young Researcher Award from the University of Ottawa (2009) and an Early Researcher Award from the Government of Ontario (2010). She was also named a Research Fellow of the North American Society for Sport Management in 2009. She and one of her doctoral students also won the 2014 Sport Management Association of Australia and New Zealand Best Conference Paper Award. Dr. Parent’s research focuses on organization theory and strategic management, primarily in the context of major sport events (e.g., the Pan American Games, the Games of La Francophonie, FINA World Aquatics Championships, the Youth Olympic Games, and the Olympic Games). She is interested in the governance and management of the relationships between the organizing committee and its various stakeholders. She teaches sport management courses in both official languages at the undergraduate and graduate levels. She obtained her PhD from the Faculty of Physical Education and Recreation at the University of Alberta. She became interested in sport management because of her background in figure skating, having been a competitive figure skater, coach, volunteer, and administrator. This led to a masters' degree in Sport Administration and a stint as the Technical Officials’ Coordinator for the 2001 Games of La Francophonie. Most recently, she was a protocol and language services manager for the 2010 Vancouver Olympic Winter Games. She has also consulted for the Aquatics Federation of Canada, the Office of the Commissioner of Official Languages, and the International Olympic Committee. She currently sits on the Canadian Sport Policy 2012 Policy Implementation and Monitoring Work Group and is co-chair of the 2015 North American Society for Sport Management Conference. Dr. Parent’s international research program on sport event governance has garnered her over $1 million in external funding (research grants, operational, and contracts) from the Social Sciences and Humanities Research Council of Canada, governments, and industry as principal investigator or co-investigator. She has obtained published articles in top management and sport management journals including the Journal of Sport Management, European Sport Management Quarterly, Sport Management Review, Journal of Business Ethics, and Event Management. She is the co-author of Managing Major Sports Events: Theory and Practice (with Sharon Smith-Swan, Routledge, 2013), Understanding Sport Organizations: The Application of Organization Theory (2nd edition, with Trevor Slack, Human Kinetics, 2006), and Key Concepts in Sport Management (with Terri Byers and Trevor Slack, SAGE, 2012). 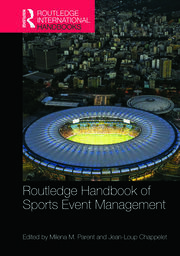 She has co-edited The Routledge Handbook of Sports Event Management (with Jean-Loup Chappelet, Routledge, 2015) and The Youth Olympic Games (with Dag Vidar Hanstad and Barrie Houlihan, Routledge, 2014). She has presented her research at various international management and sport management conferences, including the North American Society for Sport Management, European Association for Sport Management, Sport Management Association of Australia and New Zealand, Administrative Sciences Association of Canada, and Academy of Management conferences.